We are a new church with deep roots in the area. We formed as a merger of Jireh Baptist Church and Pemberton Evangelical Church. We both had the same aims in reaching out to the local community with the gospel so it made good sense to join together to do this. The following information relates to the history of Jireh Baptist Church. The history of Pemberton Evangelical Church will be added in the near future. Jireh means provider and is one of the names for God in the Old Testament and this has been evident over the 168 years of Jireh's existence. It's beginnings were in 1848 when a group left the Church of England, dissatisfied with the preaching. After initially holding meetings in a house they rented a room. Numbers rose and in 1851 five of those meeting together wanted to be baptised and formally constituted into a church. They gave their testimonies to Mr Vaughn who later became pastor to Shaw Street Strict Baptist Church, Liverpool. They were baptised by him on Monday 31st March 1851 (it is thought) in Wigan. The following Sunday, April 6th, they were formed into a church by Mr Forster of Blackburn, who administered the Lord’s Supper on that occasion. By 1863, ten more had been baptised, although some had left. It is clear that many more attended than became members. In 1863 and the beginning of 1864 there was quite an increase in attendance and financial support. The room had become too small and cramped so it was decided to build a chapel. One of the members of the congregation, Jane Farrimond, gave the land needed - God had provided for His people. The first baptism in the chapel was of Jane’s brother, George, on 13th December 1865. Another brother, Henry, became the first pastor in about 1870 after several years as a deacon. About 20 people were baptised during Henry Farrimond’s pastorate and the church prospered. In 1884 after 14 years ministry Henry died of cancer of the jaw aged only 58 years. The Sunday School hall had been added in 1867 and children’s work has continued ever since. A Sunday School Superintendent was appointed and the Sunday School had its own committee and finances. About 1873 a library was established and would have been a valuable resource for those who could not afford to buy books. Sunday School outings were soon established and Rivington Pike was a popular venue. The first Sunday School Anniversary was in 1923. During the improvements made to the building in 1926 the hall was divided to make an upper hall that was then made into classrooms with screens. Changing times eventually led to the children’s work being adapted to our present pattern of Toddlers’ Time Tuesdays, Adventurers on Wednesdays and Discovers on Fridays. Since 1990 we have had an annual Easter Holiday Bible Club aimed at the 4’s-11s. The building has seen relatively few changes since 1864. In 1926 electricity was installed, the old forms replaced by pews, the pulpit removed and the upstairs hall and kitchen added. 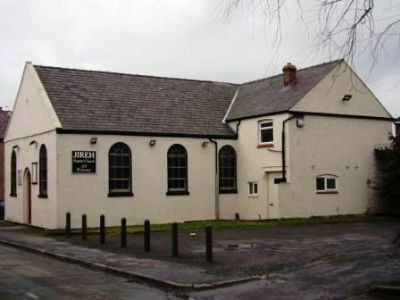 In 1966 Orrell Council proposed to demolish the Chapel in a slum clearance programme. The land offered for a new building was unsuitable and matters dragged on throughout local government re-organisation. Eventually in 1975 the building was reprieved and its prominent main road site is God’s Providence for the furtherance of His work. In the late 1980’s subsidence was causing problems under the back porch. This led to a 5-year battle with British Coal as to who was responsible for the damage. Eventually British Coal agreed that the damage was caused by mining subsidence. In 1993 British Coal completed the underpinning and repair work but the strain on the building caused by the subsidence had affected the roof of the Chapel. This had to be repaired and the rendering replaced, which was in a very poor condition. This very expensive work was carried out in 1996. Loans had to taken out to cover the cost but God provided for His people by supplying the means to pay off these loans much earlier than expected. Jireh has had only 6 pastors in its lifetime so far. The first pastor, Henry Farrimond, had been one of the earliest members to be baptised - in October 1852. His obituaries show that he was highly thought of and cared deeply for his flock. It was not until 1933 that a second pastor was called - Thomas Clough, who had been baptised at Jireh on April 19th 1916 and had served as a deacon. His pastorate lasted less than 2 years as he died suddenly in February 1935 aged 55 years. It was many years before the church felt ready to call another man, this was Mr Mutimer but unfortunately due to ill health his was also a very short term of office from 1973-5. Trevor Baker came to Wigan in 1976 and was used by God in many ways over his 20 years in office. A modern Bible translation was introduced, the church was taught through expository preaching and several baptised. In 1996 he left to work for the Albanian Evangelical Mission. The church was then cared for by overseeing elders from another church as it waited on the Lord for the man to lead it forward in the future. Alan White became pastor in September 2004. His ministry and pastoral care was greatly appreciated. Alan and his wife Georgie came from a church in Maesteg, South Wales. In 2009 Alan 'retired' but continued to be actively involved as a Teaching Elder. The church looked for a new pastor and through our friends at Grace Baptist Church at Southport we were lead to Matthew Gray(who was a member there). On 1st September 2012 Matthew began his ministry and moved to Orrell with his wife Helen and their three Children. You can find details of the service held on that occasion here. Over 168 years have passed since 5 people covenanted together to form a Bible believing Baptist Church. From this small beginning the church has seen numbers rise and fall, people come and go, the times of services and types of meetings adapted to changing circumstances but God has remained faithful to His people. God provided a witness to Himself in this corner of His world in 1851 and He has kept that witness alive during that time. We thankfully pray that He will continue to do so.